Let me tell you all about my new Sally Shirtdress! Why yes, Madge, it is a Sally! After the completion of my first shirtdress ever (McCalls 7351) I got the bug - I needed to make more! I happily had picked up this new-to-me pattern at the Pattern Review Weekend pattern swap (thanks to whomever it was who let it go). 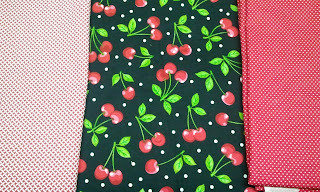 Added to that, it's Indie Pattern Month over at the Monthly Stitch, and the first weekly challenge is to make something by a designer who is "new to you". 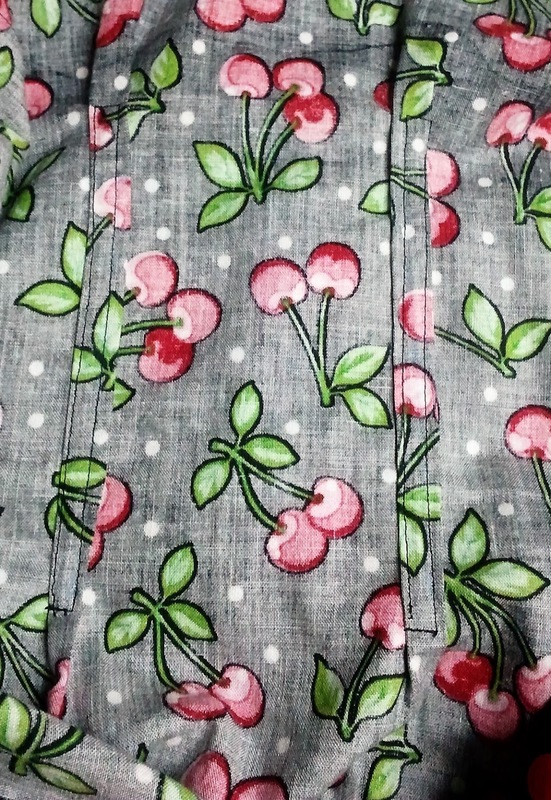 I've never made anything by Serendipity Studio before, so the Sally Shirtdress moved to the top of the queue. To suit the vintage styling, I thought that a photoshoot at The Stratford Antique Warehouse would do the trick - thanks to Tracy and her wonderful staff for letting me take pictures and for chatting about sewing with me. And now for the pattern itself -- I really enjoyed making this one. The Sally Shirtdress is an interesting design. It has four pieces: the collar, one long front and one long back, and the sleeve. Plus the trims, if you want to count those as extra pieces. It is sewn together and then you fit it by adding pleats in at the waist - you make it as fitted as you want, and put the waist where you want it. There is a rather complicated mathematical calculation in the instructions that is a bit confusing, so I just used the measurement of the waist and then divided it evenly to space my 1" pleats. It shapes it up nicely! I slightly extended the pleats higher in the back to reduce puffiness in the upper back, otherwise followed the pattern suggestions for size. Once the pleats are sewn, they are pressed flat along the centre and topstitched to keep them tidy. I've shown a photo of the insides, as they are completely invisible on the outside! I cut the "above knee length" view with no shortening done except for a small pinch out of the upper back length-- I am 5"2 so be aware if you don't like really short things. I also chose the trim that is a flat band. 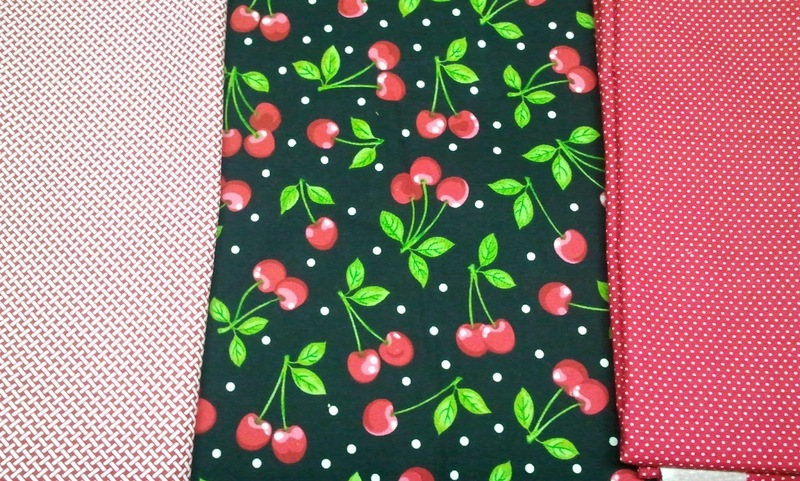 The pattern gives options like a ruffled band as well but I thought I had enough going on with cherries and dots. and all the red & white glassware too! The flaw in this pattern is that there are no pockets included. I added basic side seam pockets using a pattern piece from another dress, and placing them as usual with the hand opening 4" below my natural waist. You'll have your own perfect placement, so if you add pockets just measure a favourite pattern and place accordingly. The other thing to be aware of is that the pattern assumes quite a bit of sewing knowledge. For example, she states "make a bias strip" for the trim but gives no instruction. Or, when setting in the sleeves, she tells you to pin in place, put the sleeve side down when sewing and just stretch and ease the the excess fabric in the armhole as you sew -- no gathering stitches, just all freehand. And she adds, "if you have any tucks, unpick and just sew again". It's all rather freeform, and while I was a little suspicious of this technique, these are the first sleeves that I've ever set in perfectly smoothly on the first go. So there's that. I actually really enjoyed the way the pattern was designed. I like to figure things out as I go and learn new ways of doing things, and I did both with this pattern. It had a relaxed, freestyle feeling to it. So if you are okay with a different approach to things and with looking things up as you go, you'll like this pattern. It is a great silhouette, really fitted to the individual figure, and goes together quickly. I like it! We had a gas with my new Sally at the Antique Warehouse! What a lovely dress, and a perfect setting for your photos! Who doesn't love a shirtdress? Enjoy! Cute dress and perfect location for the photos. 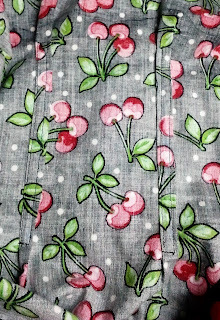 Love the cherry fabric. Love your photos, such a nice location. Pretty dress and the location was perfect for the photo shoot! Very helpful information about this pattern. Thanks! I'm glad you found it helpful. It was a fun pattern to try and I thought it went together quite easily overall. It's just plain ole cute!